Around a quarter of Himalayan snow leopard and wolf diets are livestock, the rest being wild prey, according to a study published February 8, 2017 in the open-access journal PLOS ONE by Madhu Chetri from Inland Norway University of Applied Sciences, Norway, and colleagues. Killing livestock creates conflicts between top predators and pastoral communities, and is a main challenge for conserving snow leopards, which are endangered, and Himalayan wolves, which are rare. These wolves prefer the open grasslands and alpine meadows that are also frequented by pastoral herders, and snow leopards prefer the steep terrain associated with montane pastures. 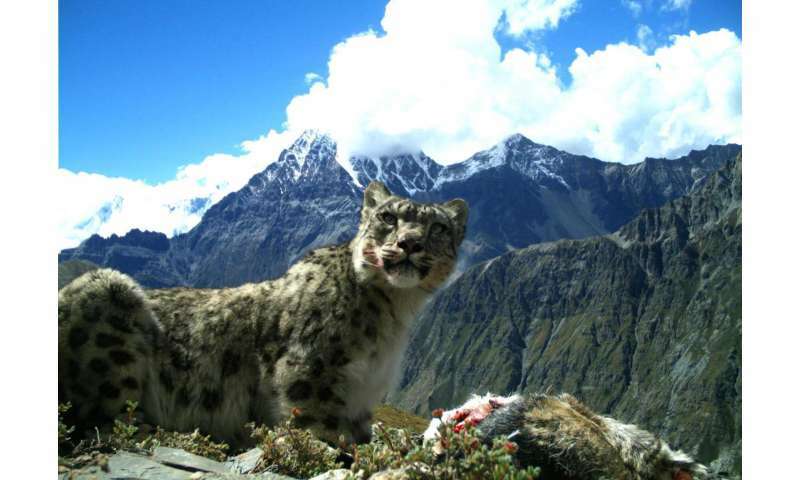 To assess prey preferences of these carnivores, Chetri and colleagues analyzed DNA and hairs in 182 snow leopard scats and 57 wolf scats collected in the Central Himalayas, Nepal. The researchers found that in keeping with the predators' habitats, snow leopards preferred cliff-dwelling wild prey such as bharal, while wolves preferred plain-dwelling wild prey such as Tibetan gazelles. In addition, livestock comprised 27% of the snow leopard diet and 24% of the wolf diet. Livestock occurred more than twice as frequently in scats from male snow leopards than in scats from females. Although livestock constitutes a substantial proportion of the predator's diets, little is known about the actual predation impact on the pastoral communities. Hence, the researchers' forthcoming work focuses on estimating livestock mortality rates and identifying factors associated with livestock loss.